A natural ‘real milk’ alternative to those sensitive to cow’s or soy milk. 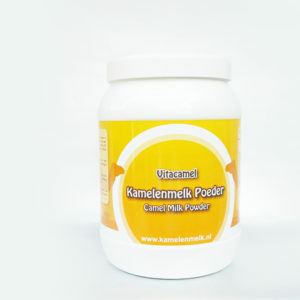 Fresh milk is not always possible to transport, therefore camel milk powder was developed. This powder is made from 100% pure camel milk. Because of the special process of spray drying, all the nutritional values and qualities of fresh camel milk are preserved. Milk powder is as healthy as fresh milk, it’s just easier to storage. In a dry place the powder has a shelf life of one year. The powder is packed in tubs or bags from 200 grams, which is enough for 10 glasses of milk. Not everybody likes the taste of the milk powder, in this case we recommend to add cocoa powder to make chocolate milk or to order our vanilla milk powder. Camel milk powder was developed because fresh milk is not always possible to transport. The powder is made from 100% pure camel milk with all the nutritional values and qualities of fresh camel milk are preserved.